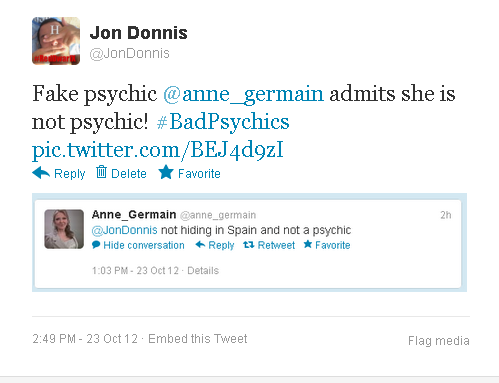 #BadPsychics: TV psychic Anne Germain admits to me that she is not psychic! TV psychic Anne Germain admits to me that she is not psychic! TV psychic Anne Germain who was recently exposed as a fake in Spain, after it emerged that a researcher would compile information on people she would then give readings too. She has also been accused of using a hidden earpiece much like Sally Morgan uses. Anyway I decided to challenge Anne Germain on Twitter to see what she had to say for herself. You can imagine my amazement when she admitted that she is not psychic! Rare to see a psychic admit they are not really psychic. I have got a feeling she is playing with terminologies here, but one way or another she has officially admitted she is not a psychic, which is hardly surprising to anyone with half a brain anyway. Make sure to follow me on Twitter @JonDonnis where I generally Tweet about Bad Psychics, Football, and on Mondays I tweet about Nigella Lawson! If you have never used Twitter or don't understand it, we have a great guide on our FORUM which can help anyone get started on there. "She has also been accused of using a hidden earpiece much like Sally Morgan uses". What? Sally Morgan is a fake too? Well I never! You are a moron. Just because she says 'not a psychic' (meaning 'actually a medium') you jump on the bandwagon like some appalling tabloid journalist with a lobotomy and blog this sensationalist bs. The earpiece is to keep in contact with the producer; like EVERY person on TV wears. And yes; you only have half a brain. "I have got a feeling she is playing with terminologies here,"
I know exactly what she was saying, I was having a bit of fun. As for the earpiece, YOU say it is to keep in contact with the producer, during live stage shows you have minimal directions from the stage director/lightings technician. You do NOT need an earpiece. Colin Fry doesn't use one, Derek Acorah doesn't use one, and these two have both played huge theatres. It seems strange that any psychic/medium would need constant contact with someone off stage. Lets look at the facts. Anne Germain would get pre-written notes from a researcher regarding people she was going to read! This is hot reading any way you look at it. The spiritualist movement was born out of fraud with the "Fox Sisters" and has been riddled with fraud ever since. 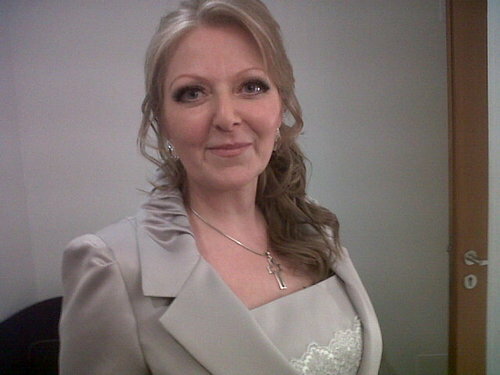 At the very least any stage psychic should be doing everything they can do avoid any such allegations, but Anne Germain has done the opposite by using researched information and an earpiece. "Every medium is psychic, but not every psychic is a medium"
I am well aware of what the associated words and terms mean. But at the end of the day this article will be listed on google, people searching for info on Anne will find it, and they will be educated as to some of her methods. Anne Germain does NOT talk to the dead in my opinion, she uses known psychological techniques as well as it seems notes from researchers and direction from an off stage source. People should be able to make up their own minds as to whether she is legit or not, but all the facts point to the idea she is not. And ask yourself, knowing all these things who is really the moron? The person who doubts she has magical powers and can break the laws of physics at will, or the one who believes she can? Only one moron here and it isn't me! I have known Anne personally for over 25 years. We met when.i.went to see her for a reading. and i am very proud to call her my spirit sister. No way is Anne fake! She is a fake though, she uses well known psychological techniques to convince people she knows things about them. If you have a recording of her reading of you I 100% guarantee I can show you EXACTLY how she does it. You may be friends with her, she may be a lovely person, but one thing she cannot do is communicate with the dead. Anne Germain is not fake!! I have been a client of her's for many years and have been thoroughly happy with her accuracy. You are wrong and very damaging! Have a reading with her and film it, Post it up here on your wall! But she has already been exposed as a fake, and do you really think she would ever give me a reading? I have exposed 1000s of mediums as frauds over the years! If you have a reading with her, why not let me see it/hear it, and I will show you exactly how she did it! How about that! I hope you publish my previous message. Have a reading with Anne - It is really the only way you can come from a place of truth, and not tabloid fodder. Why wouldn't I publish it? I did in fact and already replied. Can This Ever Get Old?